I gladly call you back! DATRON AG gives an extremely positive summary of the EMO 2013 in Hannover. There was a very active visitor interest in DATRON milling machines and tools at the main trade fair of the industry. DATRON presented 7 high-tech milling machines in action at the recently concluded EMO in Hanover. The EMO was the perfect platform for the world premiere of the new ‘MLCube’, the latest HSC portal milling machine made by DATRON for cost-effective large format machining of aluminium, among other materials. The trade audience was impressed with the power and precision of the universally usable product innovation, on which milling of large-scale high-tech components was demonstrated live. The MLCube is suitable for extremely cost-effective machining of aluminium, brass and plastic sheets or for high-speed milling of composites. 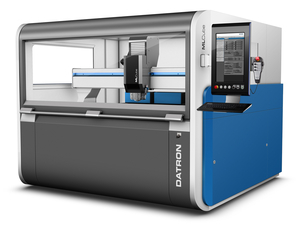 With an effective working area of 1.520 x 1.150 x 245 mm, the new DATRON CNC large-format milling machine was developed for industry companies that manufacture, for example, many small parts from large sheets or large-format housings. The company also demonstrated for the first time the highly dynamic DATRON M10 Pro with 8kW (HSK-E 32) power spindle, which meets the highest demands on precision and also features the ability to use tools with internal cooling. Erwin Sowa, CMO of DATRON AG, commented the success of the trade fair saying: “Our presence at the trade fair delighted both visitors and the specialised press. The wide variety of materials that can be processed with the MLCube, its electrically switchable vacuum clamping technology and its extremely ergonomic chip container design turn our new development into a particularly versatile and productive machine for sheet processing. Cookies are small text files held on your computer. They allow us to give you the best browsing experience possible and mean we can understand how you use our site. Some cookies are required, otherwise parts of our site won't work for you. By accepting cookies, you receive the full experience. 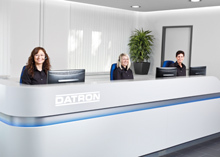 Learn more on our DATRON Privacy Page.